A Spanish watchtower, built in the late 1500's was the predecessor of the present St. Augustine Lighthouse. St. Augustine is the site of the oldest aid to navigation in North America. The original watchtower became Florida's first lighthouse in 1824. However, by 1870, the tower was threatened by shoreline erosion and construction began on the current lighthouse. The new tower was completed in 1874. The old tower succumbed to the sea during a storm in 1880.Constructed of Alabama brick and Philadelphia iron, the lighthouse is St. Augustine's oldest surviving brick structure. In 1876, a brick light keeper's house was added to the site. Light keepers' and their assistants lived and worked there until the tower was automated in 1955. 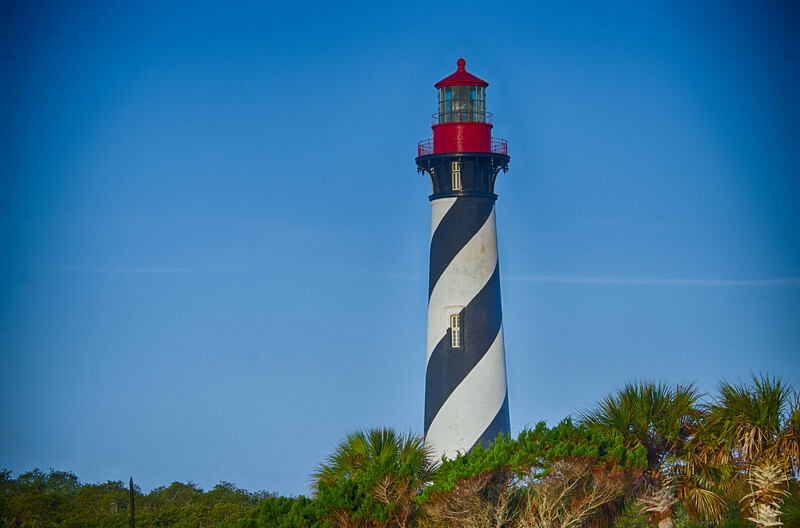 The St. Augustine Lighthouse rises 165 feet above sea level and contains 219 steps. At the top, a first order Fresnel lens serves the beacon. The St. Augustine lens consists of 370 hand-cut glass prisms arranged in a beehive shape towering twelve feet tall and six feet in diameter.